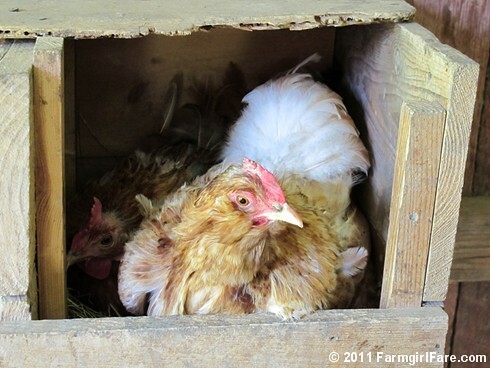 Especially if you're the one crammed into the back of the nesting box. And it's not like we're short on space. That's our Lucy Cluck Cluck! © FarmgirlFare.com, where nobody wants to give up their favorite spot, even if it means crowding a poor nameless hen (some of you know that it can take years to get a name around here) who's just trying to hatch out some eggs—and Lucy Cluck Cluck is molting (the natural process of losing and regrowing feathers), which is why she currently sports that silly looking elegant poofy white tail. Ah chickens! Gotta love 'em! Maybe they're gossiping! thanks for the close up shots - it's fun to see those beautiful feathers! I love your chickens! It's me again. I forgot to ask if you were affected by the tornado/very bad weather this past weekend? Hopefully, you are all fine! !